“Ototoxicity” refers to when something is toxic to our ears - toxic to the point of causing hearing loss. Fortunately, working with qualified ear doctors can help you avoid the long-term ototoxic side effects of things such as your prescriptions and OTC medications. Learn more in our latest blog! 'Ototoxicity.' If you randomly overheard this word in conversation, you'd probably laugh at how silly it sounds. In our line of work, however, ototoxicity is a serious topic. The term describes something that is toxic to our ears. And our staff, when meeting with patients, must constantly be aware of the ototoxic things - specifically, medications - our patients may be exposed to. Ototoxic medications can have a serious impact on a patient’s ability to hear properly and fully. However, the hearing-related side effects of widely used medications aren’t commonly discussed. Fortunately, working with qualified ear doctors can help you avoid the long-term ototoxic side effects of your prescriptions. How Do Ototoxic Medications Affect Us? Ototoxic medications can damage the inner ear’s sensory hair cells. These small, delicate cells are necessary for hearing and balance. Once they’re damaged, it’s often permanent, with no chance of recovering full functionality again. This is also why long-term exposure to loud noises is so dangerous; high-volume sounds can also damage sensory hair cells, lessening our ability to hear. However, “ototoxicity' is a different variety of ear damage, specifically referring to hearing loss caused by drug or chemical-related damage to the inner ear. Unfortunately, there is no data available on just how common this health issue truly is. A list of potentially ototoxic medications would be much too long for the average patient to keep on-hand. That’s because, in the United States, over 100 classes of drugs commonly used to treat pain, infections, cancer, heart problems, or kidney disease can damage the inner ear. 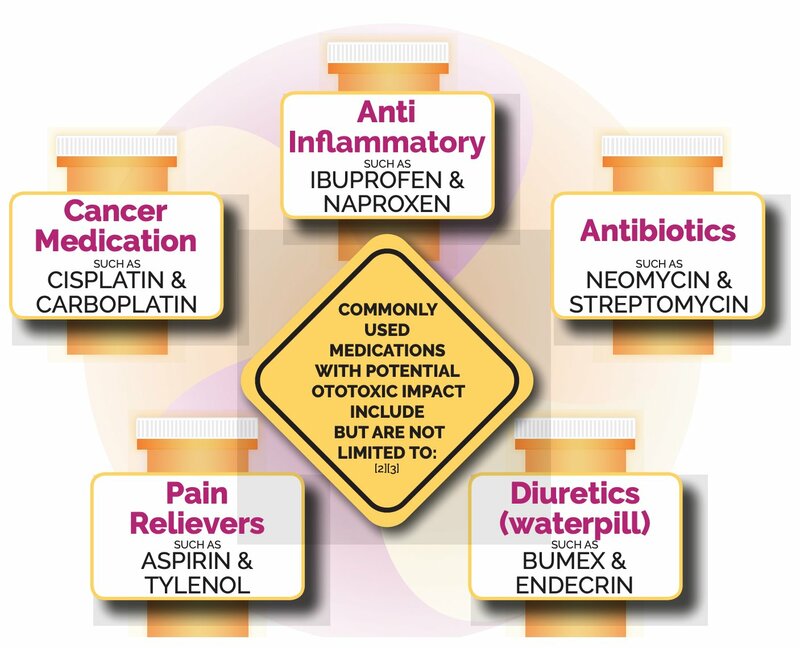 Looking at this list, you’ve probably realized that the majority of patients use these medications without experiencing ototoxic side effects. The problem is that many patients don’t realize this is a potential side effect at all. And when they don’t realize this, they aren’t able to take action to protect their ears from the possibility of hearing-related side effects. 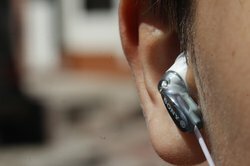 What are the Chances of Suffering from Ototoxic Hearing Loss? While exact numbers are not available for reference on this topic, we do know that not every patient treated with ototoxic drugs develops hearing loss. We also know that the likelihood of developing ototoxicity is highly dependant on which drug is being administered, the duration of its use, and medical factors such as kidney function (and whether or not a patient is using more than one ototoxic drug at the same time). Even when hearing loss occurs, the extent of the problem will ultimately vary from patient to patient. However, when hearing loss does occur, prompt care is needed - no matter the extent of the problem. “Prompt care” takes the form of ceasing an ototoxic medication as soon as ototoxicity is suspected. Ideally, though, patients will take action long before hearing loss strikes. Any time they are prescribed an ototoxic medication, frequent hearing and balance tests should be conducted, particularly in patients who are at high risk of hearing loss due to their medical background. Because of this, as a patient, the best thing you can do is talk to your ear doctor on a regular basis. Symptoms of ototoxicity may occur rapidly or appear months following the administration of a medication. So in addition to visiting your doctor for regular hearing tests, it’s critical that you always bring an up-to-date list of your medications. This will allow them to evaluate your health status and provide the testing most relevant to your concerns, symptoms, and long-term needs. At Hearing Unlimited, once we have a list of your medications, we as hearing experts can help educate you about the hearing health-related side effects of your prescriptions. We can also include baseline and regular screenings as part of your visit. This will enable true early detection of ototoxic impact, as well as allow us to respond quickly should hearing loss occur! Still have questions? Do you have specific concerns about your own hearing needs in relation to your medications and prescriptions? We’re here to help! Since 1949, Hearing Unlimited, Inc. has specialized in addressing the numerous, underappreciated issues associated with hearing loss. Contact us online or by phone today to schedule an appointment with us and take advantage of our services and resources!